In North America, almost all roads and streets were designed to ensure maximum car traffic flow, but it has become apparent that many streets have a variety of other social and recreational functions which are severely impaired by fast car traffic. Woonerf zones (often called “living streets” in English) are streets that use a variety of traffic calming measures to slow cars to a speed that does not disrupt other uses of the streets (usually defined to be pedestrian speed). Along with traditional traffic calming measures like speed bumps, Woonerf zones are often designed so that cars cannot drive in a straight line for significant distances, for example by placing planters at the edge of the street, alternating the side of the street the parking is on, or curving the street itself. The heavy focus on cyclist, driver, and pedestrian education has produced mostly careful and courteous travelers. 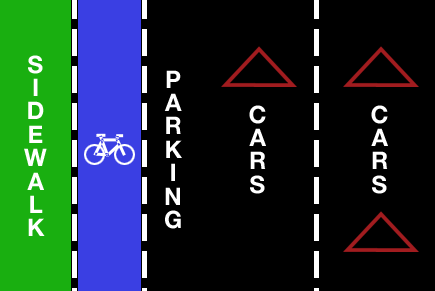 Separation of different types of traffic in certain areas has eliminated intravehicle conflict (i.e., truck versus bicycle). Traffic calming (including woonerf zones) has slowed traffic and reduced injuries, as intended. Increasing urban density and reducing urban sprawl makes it possible for people to carry on their day-to-day activities closer to home, thus reducing miles traveled, traffic congestion, and potential injuries and deaths. A recent online petition (http://gopetition.com/online/10170.html) suggesting tax incentives to promote cycling in Canada collected over 4000 signatures. It has now being sent for reading in the House of Commons. A growing number of states and local governments are demanding that streets accommodate all types of travel, not just automobiles. The concept of "complete streets" — with bike lanes, sidewalks and room for mass transit — has attracted a diverse national alliance of supporters, including advocates for senior citizens and the disabled. In the U.S., fourteen states, six counties, 10 regional governments and 52 cities have complete streets policies, according to the National Complete Streets Coalition (4). No Canadian city has a truly comprehensive, integrated, regional network of cycling facilities such as those found in so many Dutch, German, and Danish cities (5). This forces cyclists to share the road with motor vehicles for most of their trips, often diminishing the safety, feasibility, and attractiveness of cycling (5). All surveys in both Canadian and American cities clearly indicate that more separate cycling facilities—bike paths and lanes—would most encourage people to cycle. Thus, it is imperative that Canadian cities greatly expand their investment in such separate cycling facilities if they really want to increase cycling (5). The wide range of “carrot and stick” measures in European cities have helped rates of travel by bicycle that average about 10% for Western European countries, but range widely from lows of 4% to 6% in the United Kingdom, Italy, and France to highs of 20%-30% in Denmark and the Netherlands (5). Unless Canadian metropolitan areas can implement more mixed-use, more compact, less car-dependent land use policies on a truly regional level that includes the suburbs, an increasing proportion of Canada’s population will live in areas where cycling is impractical as a mode of daily transport, and will only be occasionally used for recreation (5). Unlike the wide range of car-restrictive measures found in most European cities, Canadian cities (much like their American neighbors to the south) have been quite hesitant to impose restrictions on car use or to increase its price (5). In 2007 the UK plans to introduce stiffer fines for drivers who use cycling lanes to park or squeeze through traffic (36). Traffic calming of residential neighborhoods, car-free zones, parking restrictions and supply limitations in Canada are not nearly as extensive as in most European cities (5). Gasoline prices, motor vehicle registration fees, sales taxes on cars, roadway tolls, and parking prices are generally only a fraction of European levels (5). Canadian cities and provinces have not imposed any significant restrictions on car use or imposed increases in taxes, fees, and other charges for car use, such as most European cities have implemented to discourage driving and increase transit use, walking, and cycling (5). If Canadian cities really want to further increase cycling levels, they will have to further expand cycling infrastructure, curb low-density sprawl, and impose more restrictions and charges on car use (5). Putting in policies to improve cycling infrastructure will not work unless we are committed to enforcing these policies. The City of Toronto, for example, has a government endorsed official “Toronto Bike Plan” that lists streets where bike lanes are needed. Very few of these streets have actually had bike lanes added to existing roads and even when roads are being reconstructed bike lanes are not being added (37). In the spring of 2007 the City of Toronto Transportation Services Division announced the list of road reconstruction and resurfacing projects. This list included 6 streets that the official Toronto Bike Plan said needed bike lanes. Only two of these streets will be getting bike lanes (for a total of 1.3 km of extra bike lanes) (37).